This was an unplanned dish almost 2 weeks ago. I originally wanted shrimps or kani and make a salad out of this lettuce, but I did not have time to thaw the frozen seafood. I remembered having canned tuna, so this was even a faster meal to prepare. Perfect for Lent too! 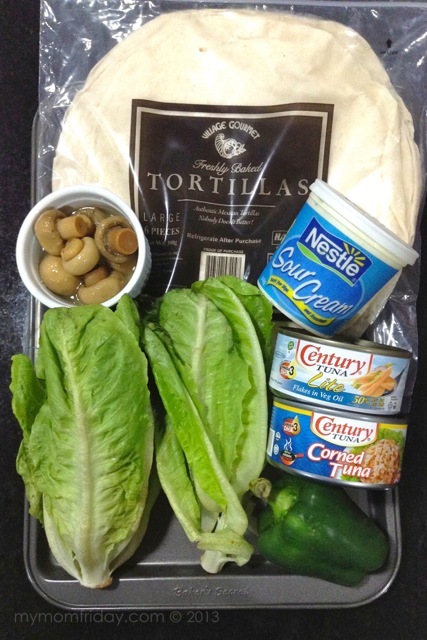 Moving along... below are the things you will need for this easy and delicious tuna wrap. Remember, I rarely measure when I cook. These are just approximate amounts, so adjust accordingly to your preference and taste. In a small sauce cup or ramekin, mix the finely chopped onions with the sour cream, add salt and pepper to taste. Refrigerate while you cook the tuna. In a pan, sauté veggies in a small amount of oil in medium heat, about 2 minutes or until bell pepper and onions are softened. Add in tuna. Continue to cook a few more minutes then transfer to a serving bowl. Heat tortillas in another pan. 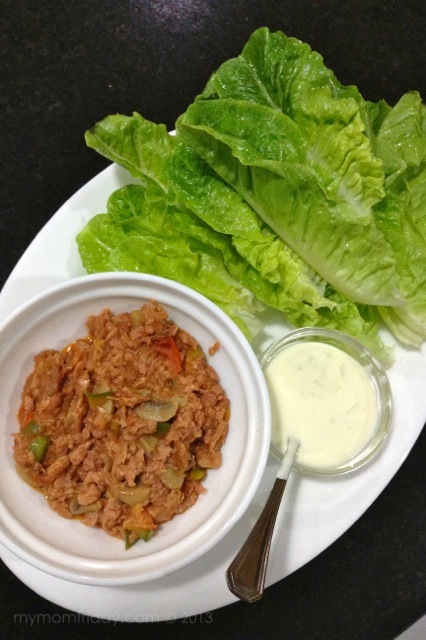 Serve immediately with the lettuce, tuna filling, and sour cream & onion. 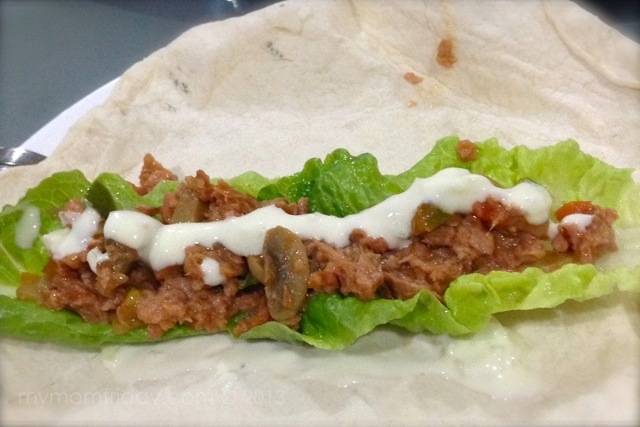 You can eat this straight with only the lettuce, or for a more filling meal, layer and roll in tortilla. 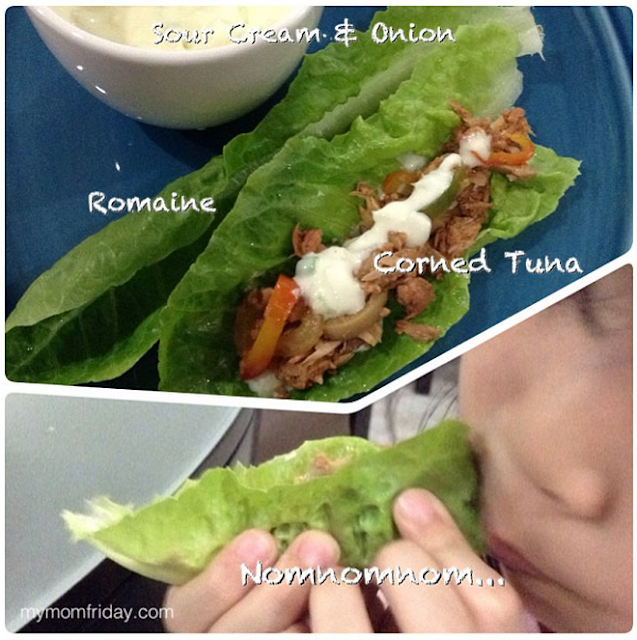 The first time I made this wrap (top photo), my girl never tasted sour cream yet, and she loved it at first try. I guess it's the combination of the fresh and crisp lettuce hugging the savory tuna with a hint of creamy tartness from the dressing. Second time around, I used spicy corned tuna and the cold dressing is a perfect foil for the spicy-salty flavor. It's addicting, I lost count how many I popped in my mouth! Perfect for Lent. A light and healthy meatless meal you can prepare in minutes!